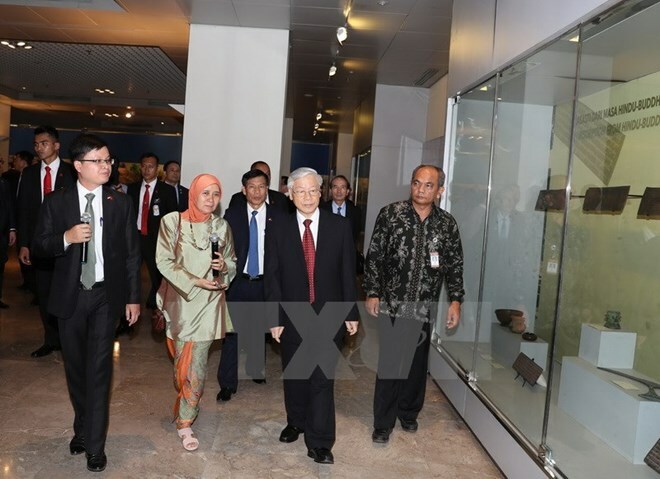 Jakarta (VNA) – Party General Secretary Nguyen Phu Trong expected the Embassy of Vietnam in Indonesia to make more contributions to developing the two countries’ traditional amity and strategic partnership during a meeting in Jakarta on August 22. Indonesia is a big country in the Southeast Asian region and one of the founders of the Association of Southeast Asian Nations (ASEAN). It is also a member of the 20 major economies (G20) and plays a crucial role in the region and around the world, he noted. The enhancement of cooperation with Indonesia, hence, is of significance for mutual benefits, contributing to the maintenance of regional and global peace, stability and cooperation, he added.